Stress is a part of everyday life. The importance lies in how we deal with it. Whereas one person might experience frazzled nerves while being caught a traffic jam, another person in the next car over might view the setback as an opportunity to mentally survey previous parts of the day and calmly think about whether certain responses were appropriate or if room for improvement exists. The good news is although many things can cause stress, there are a similar number of ways to combat it. Stress relief methods are very personal, and many people find either listening to music or picking up an instrument and playing it are wonderful ways to regain a sense of inner peace. Keep reading below to find out some reasons that may play a role in that phenomenon. Have you ever noticed that listening to particular songs often has the power to mentally transport you to different places, cause you to start unconsciously tapping your foot and find solace after grief? The point is, music means different things to different people. The fact that music is such a personal art form is exactly why it can so easily boost a person’s mood. Sometimes, a simple phrase within a song lyric can inspire someone to remember a best friend, favorite place or momentous event. Although others in the same environment may not experience the same reaction after hearing that portion of a song, to some it can make the difference between getting through the day with a smile or staying down in the dumps. 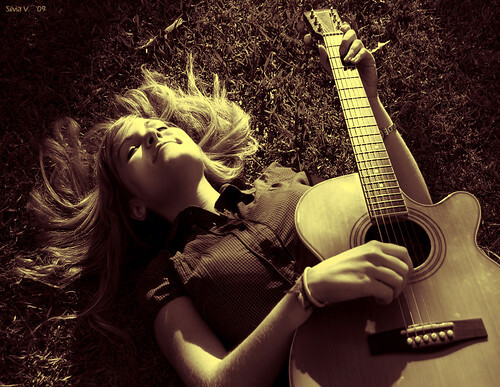 Listening to music is certainly powerful, but some people wish to take their connection to music a step further by learning to play or sing songs that have personal significance. Interestingly enough, it’s usually not important for a person to play every note correctly or sing each lyric precisely on key. Just being able to experience the rich satisfaction of learning and performing a meaningful song can improve their mood as well. That could be because it gives a person something to strive for and acts as a motivator, instead of encouraging someone to wallow in sorrow. People who suffer from depression or anxiety may understand more thoroughly that somehow music can create a brighter outlook, especially if they are permitted to bring items like MP3 players or favorite CDs into the treatment facility. Scientists recently performed a study and found the mood boosting nature of music is even more recognizable when a person commits him or herself to making an effort toward feeling happier. This revelation could be especially helpful to people who are facing a daunting challenge, such as drug-dependent individuals preparing for withdrawal. Specifically, the study, which took place at the University of Missouri, took data from 173 subjects and found people who actively intended to rely on music to improve mood had better results than people in other groups. By now it should be clear that music might be much more than just something you enjoy to pass the time. Often, hearing a personally significant song or learning to play it on an instrument could be the ticket to a happier day. Michelle is a blogger and business writer who currently freelances for a drug rehab center with private room options. She’s written about almost every topic under the sun, and loves constantly learning about new subjects and industries while she’s writing. Follow her on Google+.